Left: James N. Keith in his cavalry uniform (1880s military style). The hat he is wearing is a field hat, patterned after the French during the Civil War. It is generally called a “cappe.” Right: James N. Keith, Jr., with one of the hobby trains. Retired Army 9th Cavalry Captain James Newton Keith was unanimously selected to be the first Riverside fire chief. 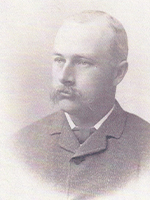 He held the position from 1887-1890. It was his responsibility to mold a core of volunteers into a professional department. The only large fire that occurred while Keith was chief was the Pavilion fire (a large wooden structure used for many early social occasions) in 1888. This fire taxed the new department and equipment and was considered a “Baptism of Fire.” The department survived and prevented a major loss to the city. Keith retired in 1890 and was replaced by George F. Ward, who is also buried in the historic section of Evergreen Cemetery. His son James N. Keith Jr. died in 1989 and is buried in Evergreen. His interest in steamer trains was a catalyst for the creation of the Live Steamers Park on Iowa and Columbia. In all, fifteen members of J.N. Keith’s family are buried at Evergreen Cemetery.